What they obviously lack is a feature that is easy to discern in all authentic fundamentalists, from Tibetan Buddhists to the Amish in the US: the absence of resentment and envy, the deep indifference towards the non-believers’ way of life. If today’s so-called fundamentalists really believe they have found their way to Truth, why should they feel threatened by non-believers, why should they envy them? When a Buddhist encounters a Western hedonist, he hardly condemns. He just benevolently notes that the hedonist’s search for happiness is self-defeating. In contrast to true fundamentalists, the terrorist pseudo-fundamentalists are deeply bothered, intrigued, fascinated, by the sinful life of the non-believers. One can feel that, in fighting the sinful other, they are fighting their own temptation. In other words, the “pseudo-fundamentalist” envies the enjoyment of the Other. 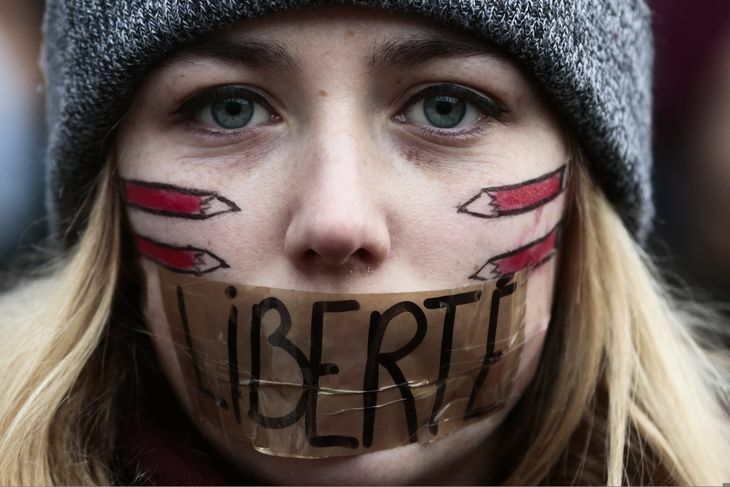 In the wake of the vicious murders at the offices of the satirical French newspaper Charlie Hebdo today, let me offer three tentative premises about blasphemy in a free society. 1) The right to blaspheme (and otherwise give offense) is essential to the liberal order. 2) There is no duty to blaspheme, a society’s liberty is not proportional to the quantity of blasphemy it produces, and under many circumstances the choice to give offense (religious and otherwise) can be reasonably criticized as pointlessly antagonizing, needlessly cruel, or simply stupid. We are in a situation where my third point applies, because the kind of blasphemy that Charlie Hebdo engaged in had deadly consequences, as everyone knew it could … and that kind of blasphemy is precisely the kind that needs to be defended, because it’s the kind that clearly serves a free society’s greater good. If a large enough group of someones is willing to kill you for saying something, then it’s something that almost certainly needs to be said, because otherwise the violent have veto power over liberal civilization, and when that scenario obtains it isn’t really a liberal civilization any more. Again, liberalism doesn’t depend on everyone offending everyone else all the time, and it’s okay to prefer a society where offense for its own sake is limited rather than pervasive. But when offenses are policed by murder, that’s when we need more of them, not less, because the murderers cannot be allowed for a single moment to think that their strategy can succeed. In this sense, many of the Western voices criticizing the editors of Hebdo have had things exactly backward: Whether it’s the Obama White House or Time Magazine in the past or the Financial Times and (God help us) the Catholic League today, they’ve criticized the paper for provoking violence by being needlessly offensive and “inflammatory” (Jay Carney’s phrase), when the reality is that it’s precisely the violence that justifies the inflammatory content…. Must all deliberate offense-giving, in any context, be celebrated, honored, praised? I think not. But in the presence of the gun — or, as in the darker chapters of my own faith’s history, the rack or the stake — both liberalism and liberty require that it be welcomed and defended. My only disagreement: the “threat” of physical violence is sufficient to trigger the third premise.